Perpetuation of the spectacle is a primary component of neoliberal activism and propaganda. What follow are some musings around different facets of the spectacle — including some ways to counter it. Please also consider reading the essay, “The Problem of Virtually Causality,” which explores patterns of causal misattribution, masking and forcing in modern society that undoubtedly further enable the spectacle to flourish. To exist. In a subjective sense, this constitutes our awareness of the self as an apparently independent consciousness, physical organism and force of will that experiences and interacts with the other consciousnesses, organisms and forces within its environment. As that awareness evolves, it will change in quality and scope, and its relationship to everything else will change as well. Ultimately, if we become aware of the essential Self – as a unitive, undifferentiated experience of All-Being – this will tend to obliterate previous egoic conceptions of individual identity. However, this does not mean that such previous conceptions and experiences are less important, or that they do not persist in some form throughout higher states. The point is that in all such progressions, existence is an a priori assessment of the condition we inhabit…even if we question the foundations of that existence (i.e. the nature of perceived reality) or regard our experiences as tenuous, compartmentalized, or incomplete. So then, what does the “freedom to exist” look and feel like? Is it the freedom from existential threats? The freedom from persisting fears of such threats? To have some fundamental confidence that, when the sun rises tomorrow, we will awaken to a new day in which our continued existence is assured? In this first component of liberty, all that is really required is the subjective perception that most conditions like these are true. There may be additional benefit in our existence-affirming judgment being rationally derived, but that may not be necessary; this is more a matter of personal belief. If I believe I am free to exist – free from immanent harm or annihilation – then perhaps this is enough, at least for this first factor of subjective felt experience. To express. Speech, gestures, body language, laughter, creativity, artistry, communication, craft – all of these and more involve expression. Here again, do I believe that I have freedom to express myself in various ways? If I do, then perhaps that is sufficient. If I exercise my self-expression and nothing overtly antagonistic happens as a consequence, then I will perceive my self-expression as free and unfettered. It should be noted that this sense of expressive freedom is not really rewarded except intrinsically; like existence itself, the mere fact that I can express myself however I wish – as long as it does not interfere with the primary drives of others – is the primary benefit and privilege this freedom affords. To effect. This component differs from the other three in that it evidences through influencing or altering other consciousnesses, organisms and forces within our environment. It is of course intimately tied to the other three, in that it acts as a mirror of our existing, expressing and adapting; it offers us proof that these conditions are real and confirms our self-efficacy. This is not insignificant, but it leads to the central conundrum of individual sovereignty: what are the boundaries of personal freedom? When must I voluntarily reign in my effect on others, so that their liberty is not impeded? And how can I best calculate such boundaries, especially if I am ignorant of the extent of some effect that I produce – if there are unintended consequences to my actions? This is something we will need to address, but for now we can at least posit that if there is a certain degree of effect that is observable from what I will to happen, then I can experience the feedback loop of this freedom and have it subjectively affirmed. Interestingly, there will also be moments of magical thinking, where an individual perceives an effect that they believe is of their making, but which really isn’t caused by them. Even this may contribute to the perception of free will. But for now, we can at least say that whenever we look upon what we have accomplished, and feel a sense of affirming satisfaction, it is the regularity and extent of this feeling that enriches and confirms our liberty to ourselves. To adapt. Can I change and grow? Can I learn and apply my knowledge to new situations? Can I explore the boundaries of my volition, knowledge, self-expression and effects on my environment, so that I maximize my individual sovereignty and the subjective felt experience of liberty? Can I evolve, and observe real benefits of that evolution? If these opportunities are afforded me without arbitrary restrictions, then my ability to adapt is confirmed, and my freedom is complete. This is the final component of the subjective felt experience of free will because it relies on the other three components to define and generate itself, just as adaptation also facilitates those other three. As a small child learns how to safely thrive within its environment, it constantly collects knowledge and techniques to adapt, so that it can exist, express and effect to its heart’s content within the dynamics of each new situation. So this is what I would propose the subjective felt experience of free will looks and feels like. It should be noted that a persisting theme in human history has been the deliberate attempt, by those who have the greatest power and influence in society, to generate these felt experiences in those who are to be ruled. This is the nature of “bread and circuses” and the engineering of a distracting spectacle for the masses. For if I believe that I am free – if I experience even a close approximation of empowerment and liberty in existing, expressing, effecting and adapting – then I just might overlook any subtle constraints or interference that carefully boundarize my will. This is one way countervailing illusions of freedom are created and maintained. Even in modern democracies we find this dynamic in play. In the U.S., for example, we are provided democracy as a pressure relief valve for collective aspirations and dissatisfactions; we vote, believing that who and what we vote for will accurately represent our desires and intentions as operationalized by our government. But then the legislation supported by the people is not enforced, the politicians who win elections do not follow through on their campaign promises, and the issues so hotly debated during those elections receive little more than lip service until the next election cycle. Meanwhile, those who can afford to lobby elected officials every day of the year, who can entice the rising stars of politics with opulent campaign war chests, and who either own most mass media themselves, or can pay for constant promotion of their agenda through that media, craft a constant quid-pro-quo in democratic government – so that government expresses their will rather than the electorate’s. Occasionally there is a victory for the people, and a sense that democratic will is being expressed and our primary drives satisfied – but we might call this “playing the freedom lottery,” in that the partial reinforcement is barely sufficient to keep the electorate coming back for more. And of course the same is true in supposed “free market” economies, where vast monopolies control what is available for consumption while funding massive marketing campaigns to invent artificial demand, insuring which goods are perceived as most desirable. And while the introduction of enticing or disruptive new technologies and products may, for a time, create price-elastic demand, eventually price-elasticity settles into a predictable range as both production and engineered dependency rigidify. It is only because capitalist enterprises and economies are growth-dependent that resource scarcity even comes into play – as corporations continue to create artificial demand and spur consumption, the pressures on availability of cheap labor and raw materials are likewise artificially exaggerated. In such an environment, innovation is just a means of restarting the clock until a given industry arrives at a price-inelastic demand once more. If that particular price-inelastic landscape isn’t desirable or sustainable, innovation isn’t the only method of upsetting the apple cart. At some point it might also become advantageous to, say, capitalize on a debt crisis, or an armed conflict, or a market failure, or terrorist threats, or any number of other mechanisms that can help reset the growth curve with some new flavor of scarcity or reshaped demand. And whether it is calamity or invention that is inspiring opportunity, it is corporations who mold that opportunity into market forces to serve their ends, under the tremendous pressures of the very expectations they create. In other words, the “freedom” of capitalist markets is as much of a countervailing illusion as U.S. democracy representing the will of the people. We really zero in on the heart of a sustainable political economy when we explore ideal ways to distribute wealth and power, and the core of that distributive vision is organization and empowerment at the community level. Why emphasize efforts at that level? Because communities where people know and care about each other provide an ideal scale for democratic decision-making; a direct democracy that can be compassionate, viable and accountable. The core of community-based proposals is a simple principle: communal engagement with every variable that impacts members of that community. This involvement cannot reside solely in elected representation or periodic referenda, but must also occur more directly and frequently within the electorate itself. That is, through ongoing communal decision-making, funding, and feedback mechanisms. Consensus-based community organizing has proven a crucial component of many historic evolutions, and deserves careful consideration. But what energizes such efforts? What causes the grass to grow? Is it a sense of justice, of righting a wrong, of fairness and equality? Or is there a deeper well to draw from? When moral creativity permeates consciousness, a more complex array of motivations percolates to the fore. There is a desire to integrate perspectives, to honor outliers along within the mean, to recognize genius and create a consensus from additive synthesis, transcending the lowest common denominator without reviling it. Why? Because passionate compassion is generative, not conciliatory; it rises above the mundane even as it carries the mundane with it, so that, to borrow a phrase from Alfred Whitehead, "novelty does not mean loss." What are the building blocks for this force for good? Once again, it is my contention that love-consciousnesses is not achievable or sustainable without careful attention to full-spectrum nourishment; beginning with each individual, the twelve dimensions of well-being must be affectionately embraced and nurtured before this energy transmutes into sustainable activism. As for institutional reforms, why not implement direct democracy at the community level? Using existing technologies, direct democracy could be regularly realized on a vast scale. Imagine a societal expectation that, every day, citizens would vote on any number of decisions with real-world consequences in their community, and do so from the comfort and convenience of their homes; we might call this "daily direct democracy." This could shape the prioritization of infrastructure funding, or zoning for certain business activities, or the number of regular police patrols in local neighborhoods, and so on. Whatever strategic or tactical concerns could easily incorporate direct democratic decision-making would be reviewed each day, and revised and adjusted as citizens observed the impact of their decisions over time. Regarding decisions where specialized knowledge is needed, votes could be organized, solicited and even weighted based on a combination of self-reported interests, expertise and experience. Imagine further that such expectations are tied to certain social privileges - that participation in governance and planning affords benefits that would otherwise be limited or unavailable. For community issues that require more advanced, rare or specialized knowledge - and perhaps coordination across multiple tiers of government or longer decision-making cycles - community members selected through automated lotteries could participate regularly as part of citizen commissions and community development teams, each with a clearly defined scope of responsibility, interagency liaising, preparatory training, and expectation of wider public input and reporting. Such teams and commissions could work in conjunction with elected officials and established government agencies for a limited period of time, then relinquish their position to the next group of lottery appointees. As alluded to earlier, some percentage of government agency positions would be selected via lottery as well. All of this is intended to mitigate the dangers of entrenched government bureaucracies, special interest influence, and career politicians who serve their own interests above those of their constituents. Here, however, citizen participation is mandatory and regular, demanding a high baseline level of education and ongoing awareness about community concerns and governance. All of these ideas highlight an important consideration: in order to participate effectively in their own governance, community members will require extensive knowledge in the principles of community resource management, economic development and consensus building, as well as a more rigorous continuation of that education moving forward. To this end, the lessons of past successes should inform the proposed dynamics between government agencies, citizen commissions, grass-roots organizations and direct democracy. These would include empowered community organizing, awareness and development efforts, worker/consumer-owned cooperatives that have worked well, and effective partnerships between CDCs, CLTs and the communities in which they reside. Replicating the checks and balances of the overall political economy, communities would need to integrate the technocratic proficiencies of elected positions, the efficiencies of central planning and coordination, a will of the people that is both informed and compassionate, and many of the risks and benefits of free markets. Under the same umbrella, the labor and resources that actualize community decision-making would, to whatever degree possible, be sourced from the community itself. How can self-sufficiency in decision-making be fostered if the cost of those decisions isn't borne by the community? As already mentioned, I like the idea of incentivized public funding and participation, where those who contribute the most in terms time, resources or ideas are rewarded with a certain level of benefit from outcomes, such as a certain quality of service, or guaranteed utilization. The valuation of contributions should of course be multidimensional, so than everyone who desires to do so can contribute in some way. But those who refuse to contribute - who consistently demonstrate that they do not value civic participation - should be afforded either fewer benefits, or benefits of lower quality. In addition, wealth generation and management can itself be reframed to the community level, and CDC, CLT and other organizational models could be expanded to include all layers of OSI property abstraction. In many ways, the specific details of community-centric visions and processes matter less than the importance of engagement and dialogue both within a community, between communities, and between each community and the regional, national and global apparatuses of economy and government. The encouragement that such interactions become more intimate rather than less is paramount. One of the most destructive disconnects of the modern age is the perpetuation of the isolated individual or family that has no relationship with their community, its government and its resources, other than through paying a fee for a service, a tax for infrastructure that is taken for granted, or a vote to empower a stranger they have never met who will make decisions for them. This distancing of cause-and-effect into non-relating, discompassionate, reflexive and often apathetic exchanges is a principle destroyer of social cohesion. To reverse this trend, we need to reconnect with each other. Still, the question persists: how do we achieve a new, more cohesive model in the most organic ways? That is, a way that isn't imposed from the top down, or purely theoretical? It's all well-and-good to champion a new vision...but how do we reify it? This vision will require memetic propagation through multiple vectors, some of which are organic and grass roots, and others that are more hierarchical and top-down, mirroring the mixed economy model itself. On the more organic side, we have individual self-nourishment, small study groups, neighborhood organizing, and cross-cultural artistic expressions of the unitive principle - all educating open-minded folks, encouraging cohesion, and energizing grass roots activism. This is not about indoctrinating abstract ideals, but providing structures and processes for an extant, innate impulse; we all yearn to love, grow and thrive, to live compassionately and joyfully, but we sometimes need reminders of how to do that together, and how to call on the skills and wisdom we already have within us. If these reminders are provided through integral, community-oriented communication that appeals to every walk of life and every stage of moral development, the rising tide of consciousness truly will lift all boats. In the next level of propagation, we have organizations of various sizes that pilot a more egalitarian, democratic and distributed forms of governance and benefits-sharing. For example, non-profit community banking systems; K-12 schools that are administered jointly by students, parents and teachers; community cooperatives that generate renewable energy; and businesses that shift from a traditional organization and ownership to worker-owned cooperatives. Then we have community level organizers, leaders and activists that initiate ad-hoc citizens commissions to champion communal decision-making. These pioneers can lobby to amend charters of established municipal and regional decision-making bodies so they incorporate communal processes. They can also create non-profit organizations that serve community interests with community input, and advocate community-centric models through other forms of change agency. At the more centralized end of the spectrum, we have existing and proposed democratic structures that can initiate necessary reforms to government institutions. Reforms like eradicating cronyism through campaign finance restructuring, lobbying restrictions, term limits legislation and so forth. Ideally, all elections could be publicly funded, and corporate influence eradicated, via constitutional amendment. A funding program could also be developed to assist workers with worker buyouts. All of this could coincide with reforms to K-12 curricula that advance the unitive principle, critical thinking and mutually empowering dialogue, and enhance the esteem of multidimensional reasoning and nourishment. And of course part of that reform could include pilot programs that demonstrate the infusion of direct democracy into central planning across all divisions of government; for example, allowing USPS workers and customers, rather than Congress, to vote on Postal Service policies, priorities and employee retirement funding. However, we know from history that such positive modeling and inculcation by itself is insufficient. Decades of successful alternative governance and economies demonstrated by planned communities, community organizing, direct democracies and worker cooperatives around the globe have not persuaded the dominant memeplex of oligarchic capitalism to make room for those alternatives. Likewise, populist movements have only nudged the established order by tiny increments. And despite the escalation of environmental degradation and illnesses linked to pollution, despite the erosion of personal freedoms and endless disgorgement of deceptive groupthink, despite the exploitation and suppression of the poorest and most desperate populations of the world and a spiraling host of other maladies, the masses either remain unmoved, or only intermittently and briefly interested. So there must also be active resistance to, and disruption of, the status quo. There are many ways to do this. One is to attenuate the "bread and the circuses" (panem et circenses) that appease the masses and medicate away any desire for revolution or reform. When the society of the spectacle (Guy Debord) is first exposed and then undone - when non-relating, commoditized social life is firmly disrupted - a facilitative vacuum allows people to create more authentic connections with each other. If an emerging majority of artistic expression, mass media, sporting competitions and popular culture embodies moral creativity, inviting constructive participation in civil society as a compassionate imperative, this would go a long way toward interrupting the pleasurable distractions and manufactured crises that currently mesmerize the American electorate. It would unmask the distastefulness of complacency. Eliminating this medication will not, in and of itself, inspire the most indifferent of our citizenry to embrace civic duty, but it will allow necessary space for a long-suppressed recognition that everyone can contribute to civil society, and even enjoy doing so. Then, in conjunction with the proposed encouragement of multidimensional nourishment and moral development, fertile ground is generated for even greater liberation. There are other avenues of activism, of course, such as making the cost of perpetuating plutocracy so painful to the plutocrats - and the alternatives so compelling - that they voluntarily relinquish control and even contribute to a solution. In concert with such efforts are constitutional changes that deprive corporations of a fictional "personhood" status in law, restructure legislatures into a more proportionately representative bodies, revoke all avenues of cronyism and neoliberal subversions of government, and enable many of the other top-down reforms already alluded to. But again, for these to happen, I suspect the creature comforts, class privileges and insulation from existential concerns enjoyed by the modern elite will require systematic interruption. For in the same way that the society of the spectacle distracts the masses from the deplorable reality of their condition, the cocoon of wealth and presumed entitlement insulates plutocrats from the horrific tragedies their opulence wreaks on the rest of the world. Of course, most of this is speculative, a vision of what could be derived from observations of history, successful systems found in other parts of the world, what I have observed firsthand in successful organizations, all seasoned with equal parts intuition and optimism. Really, though, what do I know? Only that, without prerequisite moral development, activism of any kind will only create new iterations of old systems and patterns with a fresh coat of paint. To escape ourselves, we must evolve ourselves. Only once we have begun that process can we shift our focus to utilizing the most effective mechanisms of change. Once we refine civility in our heart of hearts, we can begin to refine civil society. With this in mind, here is one additional tool to shape that efficacy. 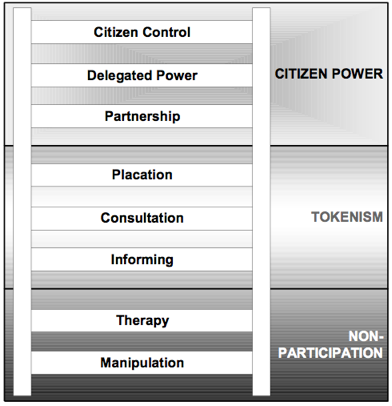 In her article, A Ladder of Citizen Participation (Journal of the American Planning Association, Vol. 35, No. 4, July 1969, pp. 216-224), Sherry Arnstein proposed an insightful way of describing different levels of civic engagement. The "rungs" of her ladder are self-explanatory, but suffice it to say that our goal should be to actualize our way to the top rungs of citizen power through civic engagement and activism, whatever form those efforts take. Anything less is, well, really just a variation on the spectacle. As erosions to the status quo coincide with the expression of new, more compassionate structures, the unitive principle has opportunity to take root. Then, as individuals, communities and whole cultures increasingly adopt responsibility for shared well-being, patterns of consumption, and the sustainable productivity of civil society, then the power and wealth of vestigial oligarchic structures will be diluted until community-centric processes overtake them entirely.